WorkflowMax is a complete online job management tool for small service businesses. However, it is ideally suited to business that require accurate, real time job reporting and staff billing reporting. Leads, quotes, timesheets, documents, budgets and invoicing are accessible from one easy to navigate dashboard. Simple timesheeting empowers your employees and contractors to take responsibility for administration tasks that are often left to business owners and managers, freeing them up to work on the business, rather than in the business. WorkflowMax integrates with more products than any other off-the-shelf job management package. It has a number of great add-on solutions to help you manage the business, such as Xero, Zendesk, Box and iPayroll. Business owners and managers spend less time focusing on internal administration leaving you more time to focus on projects and client needs. Seamless data flow means no more messing around with separate spreadsheets and systems. Quotes and Estimates can easily be converted into an active project and then invoiced with a click of a button. Optional integration with Xero accounting software streamlines this process even further. Employees input their own time against jobs with business owners and/or managers reporting on these time entries in real time. This makes it easy for you to export data to your payroll software systems. In-progress or final invoices can easily be generated using the data from jobs in WorkflowMax and instantly sent to clients. Additionally, with all job information in one place, you have greater visibility and understanding of project status and staff capacity. Most importantly, the powerful, flexible reporting gives instant, real-time snapshots of business performance. 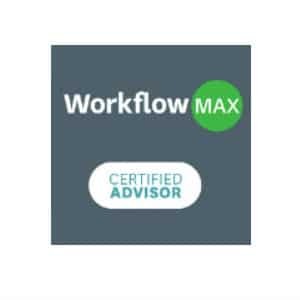 All Sorted is a certified WorkflowMax consultant. We use the system internally and have implemented it for many of our bookkeeping clients.